There are lots of paperwork important when shipping goods from a place to another. The most important document among them is the Bill of Lading or BoL. The word lading came from the English word “Loading”.Let us know about Bill of Lading in detail. Bill of Lading is the most common yet the most important document when we ship goods from source to destination. BoL is a legal tender issued by the carrier to a shipper for transportation of the shipment. 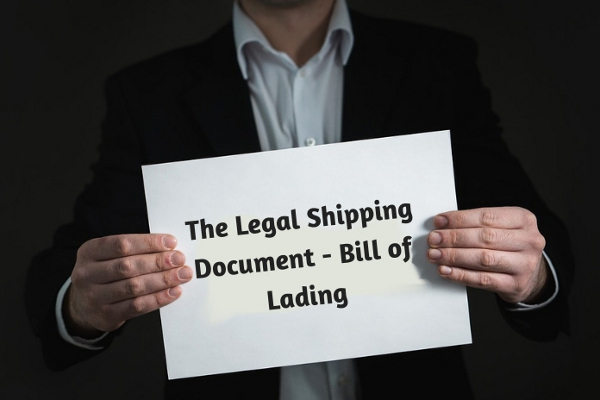 What Bill of Lading actually contains?? The contract for carrying the goods. Title of all goods in the shipment. The contract acts as an evidence that the shipment is assigned to the specific individual. This contains the details of the amount, type of goods being shipped along with the destination address. This might also contain the condition of the shipped freight. The receipt contains the confirmation whether the goods are properly loaded into the shipping vessel. Title of goods is noted as it is required to ship the goods to the consignee. 1. The name of the carrier and their signature or any legal representative of them. 2. Date of loading the goods into the vessel. 3. The place of Source and Destination. 4. Terms and conditions to be followed to handle the shipment are listed as a document. 5. The detailed information of the goods such as value, count and weight of the goods. 6. The name of the consignee. Straight BoL is used when the payment is fully paid and the shipment is shipped directly to the customer. This type of BoL is non-negotiable. Shipper’s order BoL is applicable when the shipment is purchased on credit. The transaction process occurs via a bank. This BoL is negotiable. The customer needs the original or copy of BoL to access the shipment. Air Waybill is used when the goods are transported through the air. This is non-negotiable. Originals BoL is issued when the buyer has partially paid for the goods. When the buyer presents the Original BoL and pays for the goods completely, the goods are given to the buyer. Inland BoL is issued when the transportation is done via rail or roadways. Multimode/combined transport BoL is a document issued when the shipment is transported using more than one mode of transportation. A through BoL is similar to multimode/combined transport BoL. This is issued when there exists more than one distribution centres and uses more than one mode of transportation. Switch BoL is used during foreign to foreign shipments where the supplier details may be kept private. There are two sets of bills switched to protect the information. BoL is important for safe transportation of goods from one place to another. Bill of Lading serves a legal document which helps the carrier to process the cargo according to the original contract terms set by the shipper and career. Inaccurate BoL can limit the carriers from claiming the goods and also lead to criminal offence. Since BoL contains lists of all goods along with the details, this document can be used in negotiations. Some types of the BoL can be endorsed and transferred to third parties thereby giving access to different parties in the route to control the cargo. Bill of Lading can also be used when the buyer hasn’t fully paid for the shipment. BoL is used for negotiation and can be kept until the terms of sale is finalised. For many years the bill of lading has been issued in an A-sized paper. In the modern age, there is a need to put an end to the conventional and inefficient way of issuing the BoL. So, e-BoL came into existence. Now, this is easy to take anywhere. This can be accessed via mobile devices. In the world of e-commerce, it is important to find an alternative to this conventional bill format. The e-BoL and paper BoL does not imply the same data. The e-BoL contains even more information about the shipment. The e-BoL cannot be issued in several copies nor cannot be signed. However, is e-BoL an effective replacement to paper BoL?? The answer is "Yes". The main aim of e-BoL is to replace paper BoL, but it cannot perform the same function as a paper BoL. The law has already made several attempts to create a new legalised structure for using the e-BoL. Some of the attempts have been the result of independent efforts of non- public companies, while some have resulted in the co-operation of various international organisations. The bill of lading is often referred to as a negotiable document for shipping goods from one country to another, and there is some confusion as to whether the bill of lading is really a negotiable or is a transferable document. This is especially the case in Indian law. According to the Indian law, bills of lading are not considered to be negotiable documents in their full legal sense, even though it possesses some of the legal characteristics of negotiable documents. The BoL does not have the characteristic of a negotiable document. If a bill of lading is stolen or endorsed without the shipper's approval, the receiver cannot acquire the rights to the goods represented by the bill. For the betterment of the receiver of BoL in respect of the right to delivery of the goods, and stronger evidential value of the BoL in his hands can be explained by the fact that the carrier serves as a link in the delivery of the goods between the seller and the buyer. After the BoL has been transferred to the buyer, it serves as a contract between the carrier and the buyer as a third-party holder of the bill. The buyer as a third-party holder of the bill has an independent right against the carrier, under the contract of carriage evidenced by the BoL and can demand delivery of the goods as described in the bill.